There’s a new addition to the Arch 1950 ski area and they want to start big and with excellent prices. A week in an apartment capable of housing up to 4 persons starts at ‚ 602. The luxury residences include access to free wi-fi, bars, restaurants, fitness center and even an outdoor pool. It is located near ski lifts, ski slopes and 110 km from Chambery airport. The TGV station is closer though (16 km). When you plan to rent an apartment for your ski vacation, it’s important to consider the other costs not included. In this case, the transport, the meals and the ski lifts. Star by looking for flights to France . It’s a good idea to fly into Paris and then catch the TGV to the ski area or a domestic flight (if you are choosing a ski area located close to an airport). Unless you are familiar with driving during winter, it’s not a good idea to rent a car. Next look up the general prices for the restaurants in the area or if there are any stores or markets to do the shopping. It’s cheaper to cater for yourself. As for the ski lift passes, check the daily rates vs the multiple day passes. Depending on how much time you plan to spend skiing, choose the best option for you. 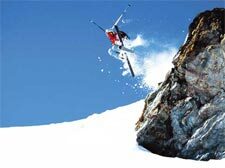 If you want to save more money, there’s always the possibility to book a ski vacation package . In most cases they include the ski lift passes along with the flight, transfers and accommodation. Innsbruck is an excellent ski area in Austria, popular among tourists from all over the world. Special deals start at $994/package and include: 7 nights in 4-star hotel with breakfast and dinner, transfers from Munich Airport, 6 days pass to ski areas, ski bus services to all ski areas and local service guide. If you are after the cheapest ski areas in Europe, head to Southern-Eastern Europe: Bulgaria, Romania and Greece. Yes, it’s possible to ski in those countries and if you choose carefully, it’s going to be a very affordable vacation. Be aware that some ski areas in Romania (Prahova Valley) are preferred by high-rollers from the capital and hence, you’ll find quite expensive prices for pretty much anything (on the other hand though, the night life is absolutely amazing and expensive, as well). If you are heading to Greece prepare to be faced with locals and several Europeans who discovered that it’s actually possible to ski in this lovely country. The popular ski areas can be found close to Thessaloniki. As for Bulgaria, it’s a preferred ski destination for Central-Eastern Europeans and the rates are really created for them. You can stay in a 3-star hotel for as little as ‚ 19/night, breakfast included (minimum stay: 5 nights).